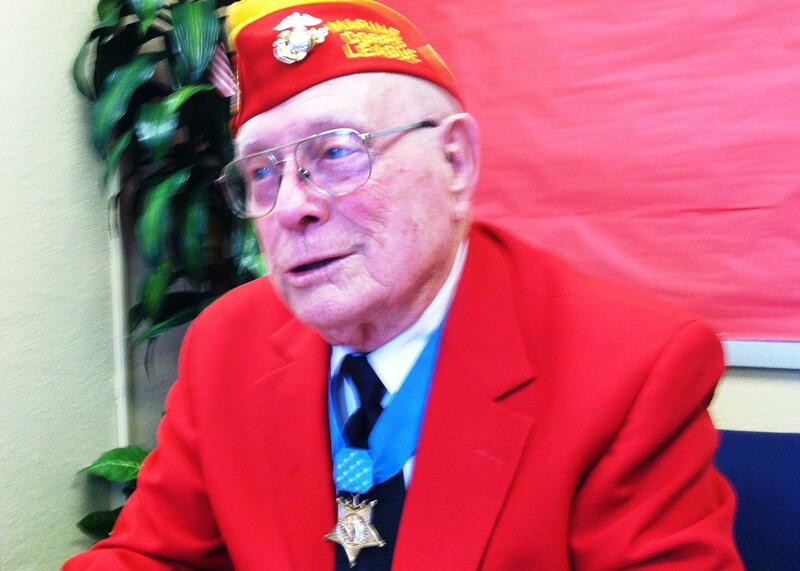 Hershel "Woody" Williams, 90, a US Marine Corps corporal awarded the Medal of Honor for his solo attack on seven Japanese pillboxes on Iwo Jima, February 23, 1945. He recalled an officer calling him and others together in a shell crater. The officer asked for suggestions on how to knock out the machine gun fire coming from several Japanese fortified concrete bunkers that had the Marines pinned down. Williams volunteered to attack the "pillboxes" using a flamethrower. For his conspicuous gallantry and risking his life above and beyond the call of duty, Williams was awarded the Medal of Honor. "This medal, I have claimed from the very beginning, it really doesn't belong to me," Williams said. "I wear it in their honor. I am just a caretaker of this medal because if it hadn't been for those individuals willing to give their life, and the other individuals willing to protect me, I wouldn't be here." Williams said during that four-hour battle, he was never touched. But two of the four Marines assigned to protect his solo assault on the pillboxes were killed doing so. He shared those details with me and another reporter prior to his presentation at Tampa's Franklin Boys Preparatory Academy. The students there have vowed to build a memorial to honor Gold Star families. Williams has dedicated himself to building a Gold Star family memorial in each of the 50 states. So, he visited the boy's academy to lend the support of his foundation, Hershel "Woody" Williams Medal of Honor Foundation, and present them with a $5,000 check toward their $40,000 goal. Medal of Honor Marine Hershel Woodrow Williams in the red jacket and center of the groundbreaking ceremony for a Gold Star family memorial. In turn, the Boys Preparatory Academy at Franklin Middle School presented the 90-year-old veteran with a special lanyard recognizing his service in WWII, his continued support of Gold Star families and his contribution to their effort to build a Gold Star Memorial. Tears welled in the eyes of the battle-tested Marine who asked for a moment to compose himself before thanking the students, teachers and others in the auditorium. He wiped his tears away as he walked back to his seat on stage. 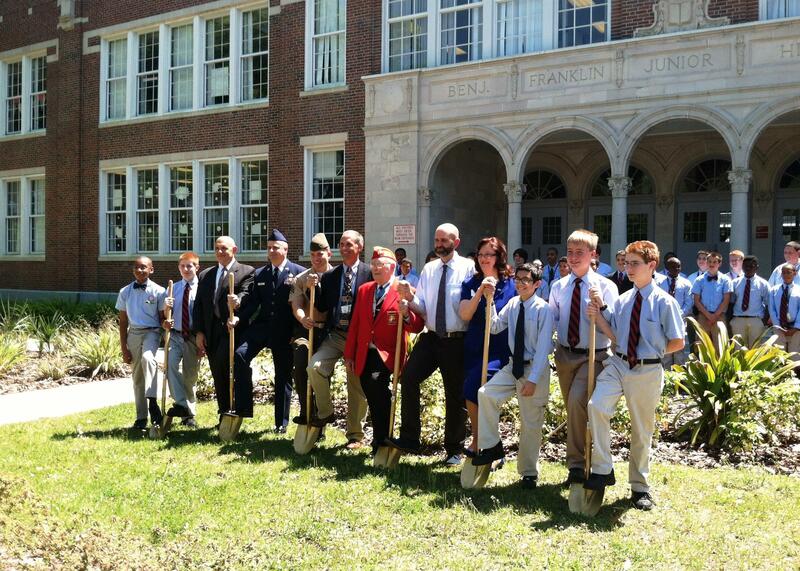 Shortly afterward, Williams joined several of the students, military representatives and school officials at a ceremonial ground breaking. They plan to build the memorial in front of the historic brick Franklin Middle School, 3915 21st Ave., Tampa, FL.